These Italian-made linoleum knives feature tempered steel blades that have been thermally attached to shock-resistant fiberglass handles and reinforced with a brass containment ferrule. They're ideal for engraving matrices in linoleum, and their sturdy construction also allows them to be used with a hammer for carving wood. These are solidly constructed carving tools at an economical price, ideally suited for fine arts schools. 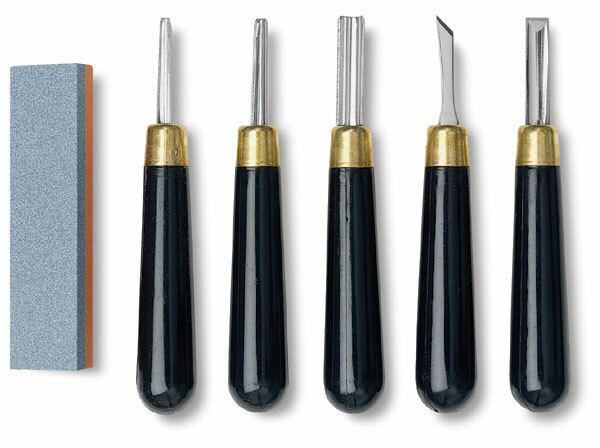 Linoleum Knife Set — This set contains a sharpening stone and 5 tools, including #301, #304, #308, #306, and #309.